For quite a long spell, it's been interesting to me how things come together, and I think I see a divine hand in it. Maybe I'll read articles and hear podcasts on the same topic in a short space of time without planning on it. There have been times when I've been writing an article and a podcast comes along with valuable material that parallels what I'm in the process of doing. It happened again. A very important truth that I've learned is balance. Ever hear the expression, "Truth out of balance"? That's when truth becomes excessive and harmful because it's misused. (I reckon that we all get a bit unbalanced when we get too agitated about something we've learned, so we study up on it, then maybe talk a mite too much about the subject.) People need to get a proper perspective on the importance and priority of some things. Seriously. I've been going on about how some Christians get judgmental with each other, majoring on minor issues, and elevating side issues to supreme importance. There were times when I named certain side issues that were not gospel issues, and people proved me right by attacking me personally about the examples I used, and ignoring the points of the articles themselves. (What's with people's egos nowadays? I can discuss a concept and use and example, and someone who was unnamed can complain, "Hey! He's talkin' 'bout me!" Narcissism much?) 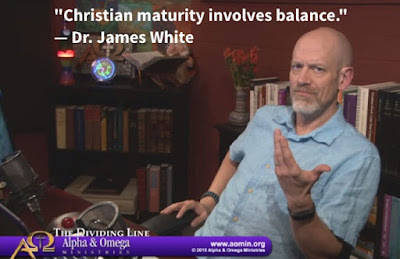 While I was cognating on judgment and balance and things, oh my, Dr. James White of Alpha and Omega Ministries had a podcast that caused me to get the bit in my teeth, jump the corral fence, and get to writing this here article. Text added to a screenshot of Dr. White's November 13, 2015 video (linked below). Dr. White is a Calvinist. I do not claim the label of either Calvinist or Arminian, but I like a lot of his material, and even like the man. (Don't reckon he'd care for me too much, I'm a bit of a jerk sometimes.) But I also disagree with some of his views. Regular readers know that I listen to (and link to) material by Chris Rosebrough of Fighting for the Faith. Pastor Rosebrough is a Lutheran! Gasp, horrors! He's taught me a great deal, but I disagree with him on certain theological matters. Should I, or anyone, have a narrow "Clone Club" perspective, "If you want to be one of his, gotta act like one of us"? If so, I'd have to reject Dr. White and Pastor Rosebrough. Since we disagree on side issues, should I condemn them to Hell? Really, many people act like that. (Maybe you no longer like me because I like someone you don't like. Ever stop to think that maybe someone with whom you disagree on a nonessential matter may actually have something valid to say, and you can learn from him or her? Try extending them some grace and Christian love. We have to prioritize what is essential, nonessential, and actually harmful. (I am not talking about cohabitating with false teachers, ain't no way.) And try mighty hard to listen without a filter from tradition or emotional bias. Sometimes Calvinists get on my nerves more than angry Arminians, but I still use presuppositional apologetics, which is rooted in Calvinism/Reformed theology. There was a bumper sticker that said, "If it ain't country, it ain't music". I've run into some people who may as well have had a sticker that said, "If you ain't Calvinist, you ain't Christian". Seriously, I was told that if I didn't accept the "doctrines of grace", then I'm an immature Christian, a sinner, or possibly even unsaved! Such a ridiculous attitude is based on circular reasoning and a wagon-load of pride. Fact is, nobody has all doctrines nailed down completely. Tinhorns on either side need to stop looking down on other Christians as if they were "lesser" or even unsaved, you savvy? Dr. White is friends with Dr. Michael Brown. They have debated each other on Reformed theology, and have teamed up with each other to debate advocates of homosexuality. People have criticized them for being friends and allies on important issues. Ever heard of dominion theology? Dr. Greg Bahnsen was into a form of dominion theology, which is frowned upon by many. He was a presuppositional apologist and a Calvinist, but I like his work anyway. There are some presuppositional apologists who are "better" than others. "I like Bahnsen's explanation of Van Til"..."I'm an advocate of Gordon Clark"..."Jason Lisle's presuppositional approach is not presuppositional enough". Oh, shut up, the lot of you! Division in the body of Christ over which version of presuppositional apologetics is right? Meanwhile, people are going to Hell because you jokers are too busy fighting and debating among yourselves to share the gospel! Priorities, people. The video and audio (you can pick whichever one) from Dr. White makes many important points. I'd like very much for you to spend an hour and give it some serious attention. Dr. White asks that you try to be consistent, think it through, and see if he makes some points. I know I needed to hear it as well as share it with all y'all. One thing I'd like you to take note of is how the word "fundamentalist" has changed definitions. With the historical definition of the word, Dr. White and I can be considered fundamentalists. However, today it is not only a pejorative, but implies someone who is legalistic, narrow minded, and just plain ignorant. That second form of the definition is what atheists and anti-creationists use. There are some other things he touches on in the first few minutes, and the main part begins at the 9:05 mark. Click here to watch or hear "An Hour Long Discussion About What Matters: Freedom, Dividing Lines, Catholicity, the Lordship of Christ".